The guidelines from the Department of Health and Children says that up to 11 standard drinks a week for women and up to 17 standard drinks a week for men is considered the maximum advised. A small glass of wine (a bottle of wine contains about seven standard drinks). It is also advised that alcohol consumption is spread out over the week and not saved for one session or big night out (known as binge drinking). No more than 5 standard drinks should be had on any one occasion, and it is also important to have some alcohol-free days over the course of the week. However, it is worth knowing that regardless of these guidelines there is no level of drinking that can be considered ‘safe’ from a cancer risk perspective. Any amount of alcohol can increase your risk of developing cancer in different areas of the body. Nearly 60% of the people surveyed did not know that they were at risk of cancer due to drinking alcohol. 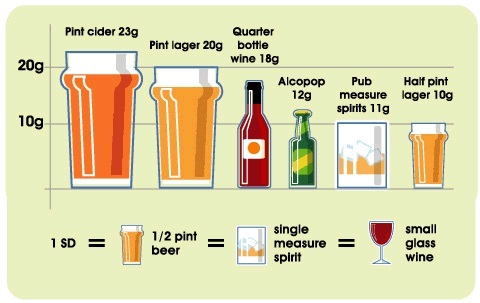 There is no level of drinking that can be considered ‘safe’ therefore because you don’t drink alcohol at all this is not a risk factor for you. The guidelines from the Department of Health and Children says that up to 11 standard drinks a week for women and up to 17 standard drinks a week for men is considered the maximum advised. It is also advised that they are spread out over the week and not saved for one session or big night out (known as binge drinking). No more than 5 standard drinks should be had on any one occasion, and it is also important to have some alcohol-free days over the course of the week.